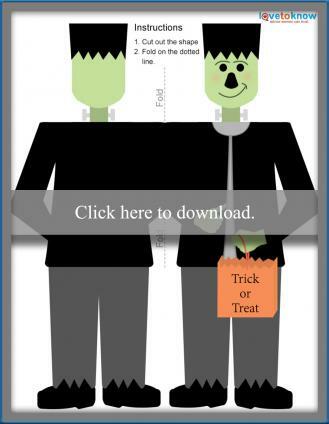 Printable Halloween cards can be used to wish your favorite trick-or-treaters a safe and happy night, or you can customize them to serve as party invitations for a spooky gathering. The following templates are free to use and easy to embellish to create eye-catching cards. If you need help downloading the printables, check out these helpful tips. This Halloween ghost would be perfect for a child. Print him out on heavy cardstock and score the crease before folding for best results. 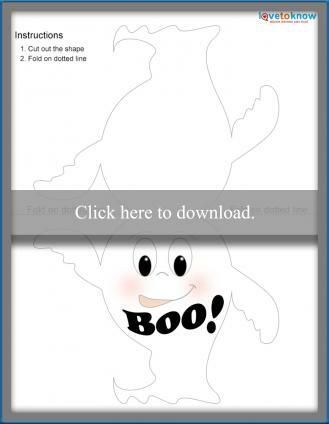 Click to download the template for this ghost card. Once you've printed and cut out the ghost card, try some of these suggestions to embellish the card and make it truly unique. Use an embossing pen and powder to make the ghost's eyes and the word "Boo!" stand out. Apply a thin coat of silver glitter glue around the edge of the entire card for a bit of sparkle. Distress the scalloped edges on the ghost's bottom and on his arms. To do this, use a small paint brush to paint a thin line of water along the edges you want to distress. Let the card sit for a few minutes, then gently pull and slightly curl the edges with your fingers until you get the effect you want. Allow the card to dry completely. Even monsters like to go out and collect candy on Halloween night! Use white cardstock and a color printer, but let the ink dry completely before cutting out your card. Download and print this Frankenstein card. Have fun decorating your Frankenstein card with some of these ideas. Get out the paints to highlight sections of the card. Carefully paint the face and hands with your favorite green acrylic paint, and add the facial features back in with black acrylic. You might also try using a crackle finish paint for his shoes or jacket for an aged appearance. Glue some small buttons to his jacket, or attach brads where buttons would go. Make the bolts on the side of his neck pop with silver aged paint. Turn the trick or treat bag into a pocket to store a real candy. Simply cut out a piece of orange craft foam or felt that's slightly larger than the bag shape on the card. Hot glue the edges of the shape to the edges of the bag on the card. The foam or felt will pucker a little bit, but this is desired. Once the glue is dry, you'll have enough space to slip in a wrapped candy or small lollipop. This pumpkin-shaped card is a blank canvas for you to create your own Halloween masterpiece with. Once again, you'll want to make sure the printer ink is completely dry before cutting out the card shape. 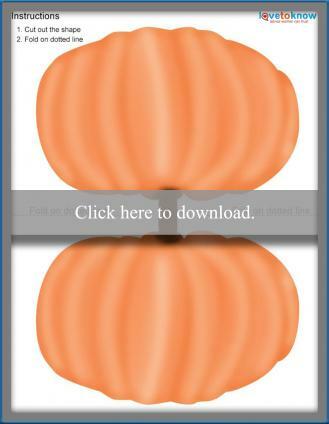 Click to download and print this pumpkin card. There are several ways you can decorate this Halloween card, but the one that will be most fun is to carve out some facial features for a Halloween jack-o'-lantern. Here are a few ways to accomplish this. Draw the jack-o'-lantern's face on the front of card lightly with pencil. Make sure the card is open, and place it on a rubber cutting mat, cutting board, or a stack of newspapers. Use a sharp craft knife to cut out the features. Next, cut out a second pumpkin shape that's a bit smaller than the card front in black or yellow construction paper. Glue this to the back of the card front so that the inside greeting doesn't show through the holes you just cut out. Use paint, markers, chalk, or cut-out paper to create facial features, and then glue them onto the card. 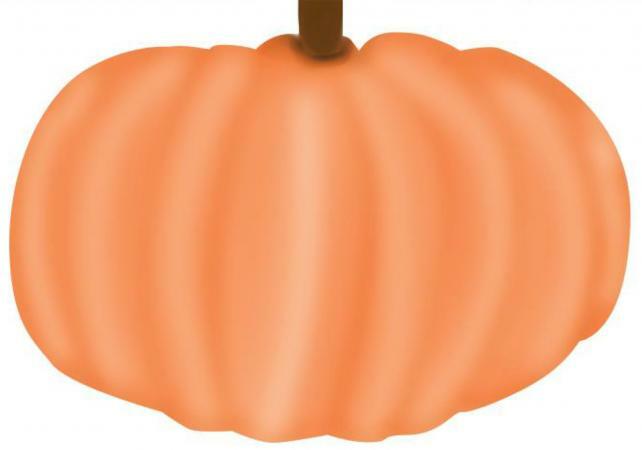 Use a pumpkin carving stencil to create quick and easy faces. Resize the stencil using your favorite image editing software, and then print it out on heavy cardstock. Cut out the stencil and then you can either trace it onto the card and cut it out as described above, or use black acrylic paint and a small paint roller or sponge to apply the face to the card. Of course, you don't have to make this pumpkin into a jack-o'-lantern at all. If you prefer, add leaves and vines hanging down from the stem using stencils, stamps, or stickers. Highlight some of the pumpkin's ridges with a touch of glitter or white chalk to make them stand out. Don't forget to add a Halloween sentiment to the inside of your card. If you have trouble coming up with an original line or poem, the following sites offer a variety of ideas. The Ink Stains blog has a nice selection of Halloween quotes and proverbs that range from creepy to funny in tone. Martha Stewart has a small collection of card sentiments. If you want to use your printable cards as party invitations, you'll find some great ideas for wording here as well. You can also opt for printable sentiments, like these ones from Bird's Cards. Color your favorite one in with markers, and then glue it to the inside of your card. Embellishing printed cards is a simple and fun way to get creative with your Halloween card making. Use the embellishment suggestions as a starting point to explore different ways to make your cards stand out.